Preston Gralla writes a great blog for Computerworld entitled “Seeing through Windows.” That title can, of course, be interpreted in more than one way — and so very often can his blogs — and those are just some of the things I like about his work. In an 8/28/2012 posting entitled “Samsung Weighs in on Windows 8: Users need the Start button,” Gralla describes three Samsung desktops (all-in-ones, actually) planned for Windows 8, all of which include an optional Start button. 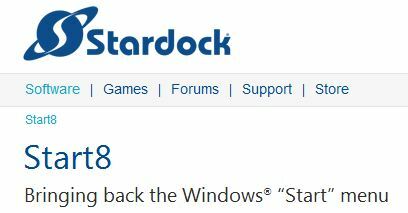 Stardock brings back the Start button but it’s still not the same! Interestingly, it looks like PC vendors will have a chance to remedy one of the biggest user and pundit complaints about Windows 8 — namely that it lacks the old familiar Start button found in every Windows version since 95, and missing in 8 in favor of the Modern (“Metro”) UI screen instead. I wonder how this capability will differ from Stardock’s free Start8 functionality: this tool puts the old familiar Start button back on the toolbar, but doesn’t offer a set of pull-down menu for all installed non-Metro programs. Instead it throws up the Windows 8 Start screen in a more contained format. It will be interesting to see what Samsung — and possibly also, other vendors — offer up to compensate or correct for this all-too-common Windows 8 complaint.